Demons tap into a deep rooted, primordial fear – primarily the fear that some powerful, demonic force with evil intent could actually take over our lives, assault our bodies, and force us to do that which we would normally never do if in full possession of our faculties. Demons are different from ghosts or other supernatural creatures in that they are commonly associated with evil, specifically a kind of evil that represents that which is diametrically opposed to the Divine. Demons don’t simply want one’s body. Demons want one’s soul as well. Demons in dreams may be representatives of those unexpressed fears; attentively they may have a more complex meaning as well – one that isn’t frightening at all, one that may actually prove beneficial both in dream life and in the waking world. Dreams about demons can actually signify a concealed part of our personality or emotion that we are also not fully aware and fear to let it surface on our mind. Interpretation of dreams having demon varies depending on the type of demon observed in the nightmare. The meaning is also derived from the color of the demon as different colors possess positive and negative shades. Even though demons may not exist in real life they are present in our mind and therefore reflecting through our dreams. In order to achieve happiness one need to overcome these fears represented by devils in regular dreams. 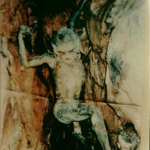 The physical properties of demon dominate the meanings of their existence in our dreams. Many people observe nightmarish dreams having demons but all are nothing but the reflections of your deep emotions present in the wits. To see a dark colored demon for example dark green, red, black and brown signifies that you are depressed regarding a failure or event in your mind. To see a group of demons encircling you signifies that you are going to fall prey to some kind of temptation which is not ideal. Similar kind of dream also signifies that you are feeling some kind of urges or emotions that you know are not proper and not comfortable with them but are surfacing your mind persistently. To see a red demon with piercing teeth implies that you have fears of poor health. To see light colored demons such as yellow, white, sky blue etc. are signs of good fortune. These kinds of dreams are healthy and signify certain important and joyous even in your life. There are a number of types of demons that may be manifested in our dream to understand what they may symbolize we need to gain a better understanding of their type. Some of the more interesting biblical accounts are those of people possessed by demons. In fact, although she is often portrayed as a penitent prostitute, the Bible itself refers to Mary Magdalene as one of the first to witness the resurrected Christ and as the woman from whom Christ cast seven demons. Many people view demons and demonic possession as purely psychological. For those people, demons do not exist as actual, alien entities but rather as defects in the psyche or a hysterical way of expressing that for which one has no words. Many other people view demons in the exact opposite manner. Those people believe that demons are, in fact, actual forces bent on destroying anything that God loves. Your belief, your interpretation is, as always, the most important. If you believe in the authenticity of demons and of demonic possession, then it is of tantamount importance that you look into the dream of your demon and establish what the demon is attacking, how it is making its attack and how you may be able to defeat the demon. Dreams of demons for those who believe in their authenticity can indicate a spiritual struggle of some sort; one that one may feel one is losing. Spiritual counseling is probably the best route to take if this is the situation in which you are in. Demons, aside from being spiritual enemies, may also be personifications of those parts of one’s self from which one has dissociated one’s self or those parts of the psyche that one has repressed. And the emotions that we experience as unpleasant are often those that get repressed. Anger, hatred, feelings of powerlessness – these are all emotions that may be repressed and which may appear in dreams as demons. If you are experiencing recurrent or vivid demon dreams, check to see if there is a situation that is bringing up repressed emotions or look to see if there is some event that you are “drowning” in order to keep it from causing you pain. OK, so maybe the demon itself isn’t helpful, but the energy behind it might be. Much like the rejected or aberrant animus, a dream demon may actually mask something that is helpful, something that, once confronted might be integrated and thereby transformed. Demons are made more powerful from the energy we put into avoiding them. In a way, demons actually hold us captive by via our attempts to avoid them rather than confront them. In waking life, many people attempt to medicate the pain of the demon, via drugs, alcohol or actually allow their demons to actively thwart their success by engaging in self-sabotaging behaviors. These are all ways of demon avoidance. However, if one can confront the demon, that is, if one can address the demon producing situation and make peace with it, then the energy that one is putting into demon avoidance can actually be used in a more productive manner. And even the demon itself can be transformed. Many people take situations that are horrific and find a way to transcend them, to use those situations as stepping stones to help themselves and others. For example, victims of abuse can confront their abusers, can confront the pain of their abuse and become advocates for others. When one is able to do this one transforms one’s demon in to one’s daimon–a genius that helps rather than haunts. Demon dreams as you know are representatives of false emotions or fears that you are not comfortable having. These fears are eating your mind but you are not ready to confront and get it over. You might get a feeling of some devilish thoughts or urges that are pushing you to do something evil after getting these dreams but actually this is the fear that you have deep down inside. You need to understand that these fears are baseless and are not real and nothing can go wrong when you have the quality to judge right or wrong. These emotions are life wood eaters to make you unhappy and depressive. You just need to confront these emotions in front of mirror and tell yourself that you are in full possession of your wits so nothing wrong will happen to you and see the effects.